Why would a totally unknown and exceedingly proper English butler suddenly appear at a very American family's front door? That's simple enough. His service was given to the family by a relative who died, and his service is much needed. 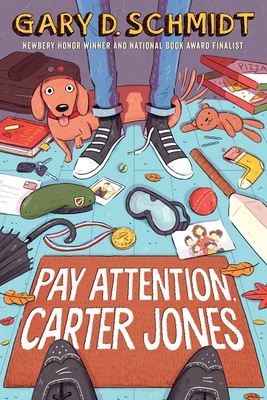 When Mr. Bowles-Fitzpatrick arrives, speaking a formal Queen's English, insisting on gentlemanly behavior, and teaching about the nobility of playing the game cricket, Carter Jones and his mother and three sisters are struggling with the first day of a new school year. Carter's life is not at all simple. His little brother Currier has died, his Army father is deployed overseas, and sixth grade is about to begin! Carter has a few good reasons to be angry, and his sharp, amusing exchanges with the demanding butler make that clear. He also needs to take a big new step in life, and the butler may be just the gentleman to help him do that. Gary Schmidt has a way of writing about loss and redemption that touched me. By the end of this uncommon novel, I felt a warm sense of connection with its characters.